Everyone knows Barbie. She is an iconic children’s toy, especially when it comes to marketing toys towards little girls. Almost as iconic as Barbie herself is Barbie’s own “dream house”. 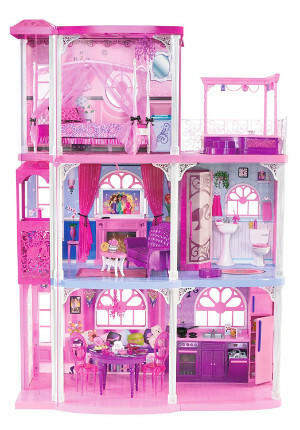 When you think of the Barbie dream house, three words probably come to mind: big, pink, and luxurious. Now days there are many types of Barbie “dream house” doll houses on the market. At times, it might seem to be a bit overwhelming to choose one. We have reviewed a few of the best Barbie dollhouses currently available. Although this is not a cheap Barbie dollhouse, it is one of the most innovative houses available now. 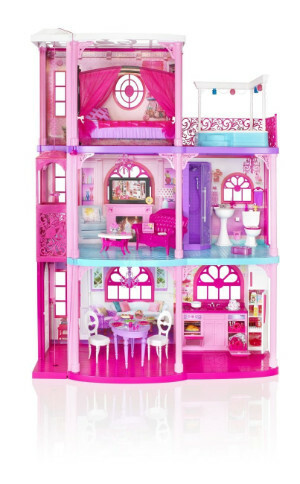 Barbie has entered the technological age with her latest Dreamhouse as it boasts many high-tech features. With six rooms over two levels, there are plenty of options for play scenarios and storytelling. 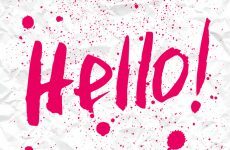 The dimensions of the Hello Dreamhouse are 17 x 49.4 x 35 inches. Many parents would argue that this is the best Barbie Dreamhouse ever made. It is best-suited children of five and over, though it is suitable for children over the age of three. Like with most of the Dreamhouses, it is not recommended for children younger than this due to the choking hazard of small parts. This Barbie doll house is excellent for any child that enjoys interactive play and toys with an aspect of technology involved. Although it is expensive, it is good value for money in terms of the number of hours enjoyment your child will get from this gift. When you move into a Barbie Dreamhouse, anything is possible. With a total of three floors and seven rooms, plus a working elevator, children can make up all kinds of fun scenarios from a cozy night into a night out on the town or even a raging party! The garage has a door that opens and closes by sliding a tab. The Barbie Dreamhouse is targeted for ages 3 and up due to the small parts that could be choking hazards. The dimensions are 30 x 8.5 x 34 inches. The Dreamhouse has a perfect space for parking Barbie’s car when she returns home. The indoor rooms have modern touches with Barbie signature designs, like the classic pink coloring. The lights, sound, and motion will entertain your children for hours on end. Even though this barbie dollhouse has lots of features, it isn’t too expensive. This amazing house is the perfect spot your child’s Barbie doll or dolls. The Glam Getaway House is suited with a latch and carrying handle so you can take it on the go! Unlatch and unfold to reveal a kitchen, bedroom and a bathroom. This Barbie doll house is suited for children ages 3 and older. The Glam Getaway House measures about 19 x 5.5 x 12.8 inches. Barbie can make a meal in the kitchen and she has two stools available for when she has guests. Her kitchen comes with many accessories, like a teapot, cooking pot and plates. With all the accessories made available, your child’s creative sense will be aflutter with decorating activities. The chandelier, in true Barbie fashion, is even colored pink. However, be very careful with the accessories around smaller children. They are choking hazards. The best part about this Barbie house is that it folds up for easy storage or to take to Grandma’s house for the weekend. 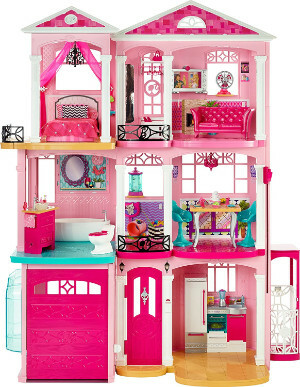 The Barbie 3-Storey Dream Townhouse offers three floors of dollhouse fun. The rooms include a kitchen, dining room, living room, bathroom and a luxurious bedroom. From the bedroom is a balcony that features a hot tub for Barbie to relax. This particular Barbie dollhouse has recently had some renovations and improvements made and now boasts a photo-real wallpaper design and pink columns. The dimensions of the Dream Townhouse are 30 x 7 x 32 inches and it weighs 23.7 pounds. Overall, the reviews for this product are staggeringly positive. Parents who have bought this toy think it has an excellent design and is far superior to many other types of Barbie Dreamhouses as there is more room to play with a Barbie doll. The main criticism is the number of parts there are to assemble as customers find the sheer quantity of assembly pieces, accessories, and furniture a little overwhelming. However, the same customers do say that the house is actually simple to put together once you start. Of course, Barbie needs a place where she can get away from the Paparazzi and wind down. Here, she can pop into the kitchen to make a tasty treat for her and her friends. The kitchen is fully stocked with goodies. Barbie and her friends can even dine outside on bistro chairs designed to look like pretty bows. Now, that’s fancy! The living room converts to a bedroom, so she can dream. The Glam Vacation Home is targeted for ages 3 and up due to the small parts that could be choking hazards. Product dimensions are 4.5 x 19.5 x 12.8 inches. 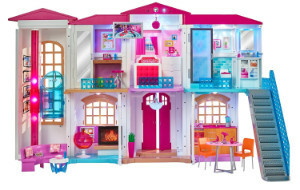 Apparently, this dollhouse is the Barbie equivalent of a Transformer because the living room converts from a first-floor hangout to a second story bedroom. The living room attaches to the kitchen, which also allows you to open up the rooftop deck. The living room includes a flat-panel TV and couch that converts to a bed. The couch bed comes with a pillow for when friends crash there over the weekend. The whole package includes the house, furniture, and accessories. This modern Malibu-style townhouse has three floors and five rooms. The closet upstairs is a fantastic place for a child to keep all their Barbie clothes and the child-activated elevator allows Barbie to move between floors. The dimensions of this house are 7.7 x 15.9 x 28.5 inches and it weighs 11.2 pounds. In comparison to some of the other Barbie houses, this one is quite basic and does not boast as many features or accessories. However, this is reflected in the price and it is a good option for parents looking for a cheap Barbie doll house. Also, it takes up far less space than some of the other options available, so it is ideal if you have limited space. When parents are looking for Barbie doll houses for sale, there are plenty of options available and each of these has something different to offer. The more affordable options are the 3-Storey Townhouse, the Pink 3-Storey Townhouse, the Glam Getaway House and the Glam Vacation House. These are ideal for anyone looking for a cheap Barbie doll house and are particularly suited to younger children, such as those between three and five years. At the higher end of the price range is the true Barbie Dreamhouse. There are more features on this dollhouse, so it is worthwhile paying the extra if you can afford to do so. It is important to remember that this product does have some negative feedback that you should take into consideration when deciding whether to purchase the Dreamhouse or not. The main problem identified was the elevator not working well. If you are prepared to take a risk on this, then the Barbie Dreamhouse will give your child hours of fun. Probably the best Barbie doll house of all those reviewed is the Barbie Hello Dreamhouse. Not only is the house the perfect space for your child to play with their Barbie dolls, but they will also have fantastic fun using the speech recognition to control the features and customizing the sounds of the house. If this is your preferred option, then be prepared to pay for a premium product. Also, make sure you have enough space available for this Barbie doll house and that you set aside plenty of time for assembly. Looking for a dollhouse for a toddler? Check them out here!